Discord is a well known chat app that is meant for gamers. That said, many non-gamers use Discord and it’s a popular app these days even among cryptocurrency groups, like some communities on Steemit. This app was founded by CEO Jason Citron, who also founded OpenFeint which was a social gaming platform aimed at mobile games. His platform was such a success that he sold it for $104 million dollars back in 2011. According to Polygon last year, Discord has almost 100 million users, which is a really impressive feat. Many then asked, how does Discord make money? They don’t even have ads in the app. 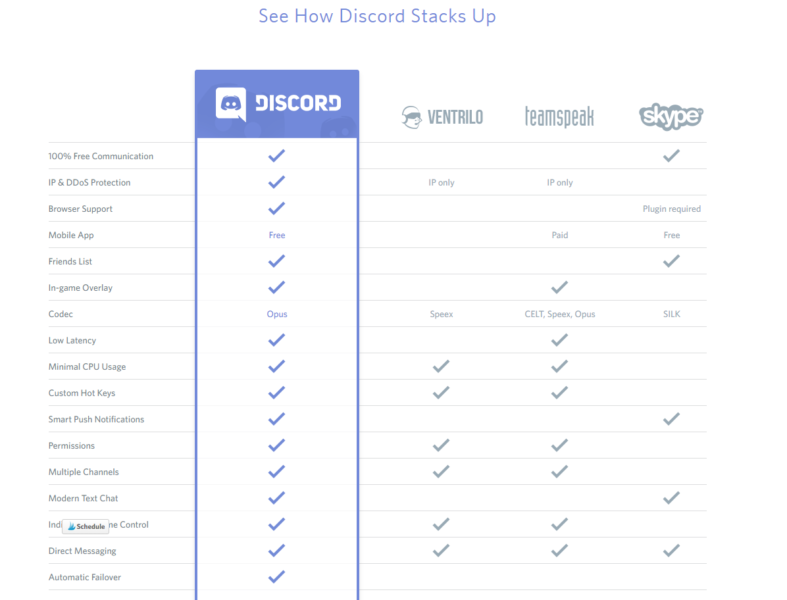 Before we examine their business model, here’s a brief overview of what Discord is. Free VoIP (voice over internet protocol) which basically means you can use voice chat for free with your friends. If you have a gaming microphone, you can use it as well. Bots are allowed on Discord. There are so many cool bots created by various developers that you’ll probably see on many Discord servers. For e.g. there’s one bot that responds to you randomly no matter what you type. Encrypted server to client communication. Discord keeps your IP address safe and is also protected against DDoS attacks. It is available on PC and mobile. You can use it like WhatsApp or WeChat on your smartphone. You can also customize your notifications only for certain messages. Minimal CPU usage and low latency. Privacy. Anyone can have a Discord account and you’re not forced to reveal your identity to others, which keeps you anonymous if you want to. There are so many features that Discord provides and personally, I feel like it’s a more high level messaging app. For first time users, it can be pretty confusing, especially when there are many functions and even bots in channels. Here’s a screenshot of their main features for better understanding and how it stacks up against other similar apps. How does Discord make money? What Is Their Business Model? We pulled this out of Discord’s help page and this is what they say. From my personal usage of Discord, they don’t have ads and they run a freemium business model where they don’t charge anyone to use it. The extract itself indicates that they make money from Discord Nitro and are planning to introduce paid sticker packs, sound packs and so on. Discord Nitro is a paid subscription of $4.99 a month to help Discord and is completely voluntary. It doesn’t impede your access even without a subscription. Nonetheless, it does provide you extra features if you do become a Nitro member. You get your own Discord tag. The number on the tag is chosen by you, so you get the benefit of a personal tag, which is kinda cool. Animated avatar. You can get a GIF avatar on your profile and the GIF plays whenever someone mouses over your name in chat. High quality screen share. Discord Nitro allows you to upload higher resolution (720p 60fps / 1080p 30fps) screen share in your chat. Screen share allows others to see what’s live on your screen, which means even good games can be shared on screen if you’re on the subscription plan. Custom emojis. If you have seen cute custom emojis on certain servers but can’t export them, you can do so with the Discord Nitro. It allows you to use these emojis on any server. Higher upload limit. You can share images or files up to 50MB at a time (from 8MB). You also get a special profile badge that indicates how long you have supported Discord. 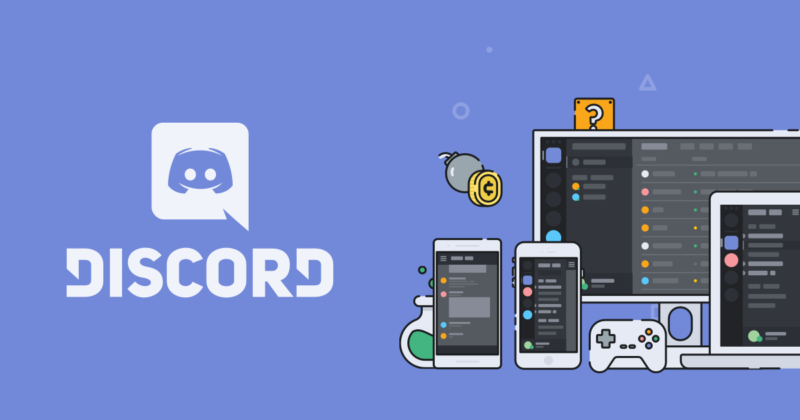 Discord has around 100 million users and even if a small percentage of them pays for the subscription, the company can earn quite a bit. That said, I doubt that many users actually pay for Nitro, at least not among my circle. Cosmetic items refer to sticker packs, sound packs or even skins mainly for vanity reasons or for an improved user experience. Stickers are quite popular these days and you can see them on Line, Facebook Messenger and other messaging apps. Skins are basically to improve the look of Discord on your screen. Think of it as changing a template or a background. Sound packs are just sounds on Discord and in the future they may allow you to have custom sounds on the app. These are cosmetic items because they don’t affect your usage even without them, but it doesn’t hurt to have them. It’s interesting to see if this new concept actually takes off. I mean, if people don’t mind spending so much money on streaming platforms, why can’t they spend a little to support the company? According to WSJ, Discord has been valued at $1.65 billion USD as of this year (2018). Most of the funding by various companies will go towards international growth and the Discord Nitro feature (which is available now). A small portion of it goes towards rewarding some of the earliest employees. 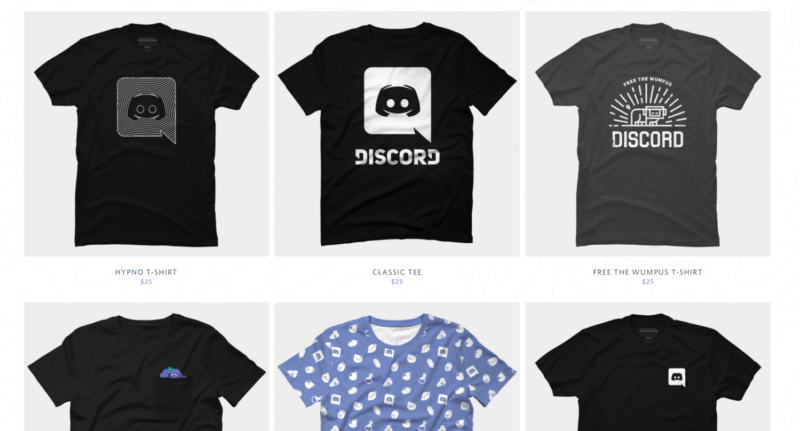 Discord has their own merchandise store where they make money from t-shirts, caps, socks and other stuff. I’m not sure how many people actually buy these merchandise so there’s no estimate of their earnings. 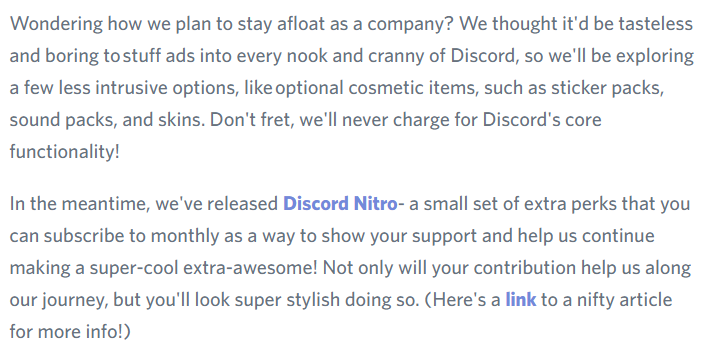 While Discord hasn’t really made money in the past (apart from merch), they have started to do so since the introduction of Discord Nitro and also through their funding. They also claim that they won’t be charging anything for basic usage of the app even in the near future. If Nitro doesn’t go so well, Discord can also look at partnerships with game companies or music companies to make some money. Since this platform was created for the gaming industry, it’s only natural that they have some collaboration. I’m not sure if they’re charging these companies at the moment. Spotify recently entered into a partnership with Discord and maybe the latter makes some money out of it. Perhaps Discord can look into charging these big companies a portion of their earning to sustain the huge server costs. Then again, they did get some funding. If you do have other ideas, leave your comments below. Should You Buy A House Or A Car First?